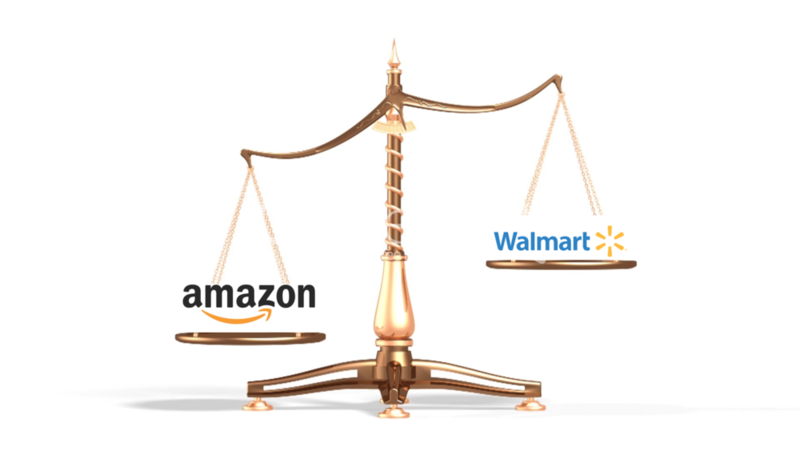 After their last earnings report, Amazon surpassed Walmart's market valuation. Despite the obvious fact that one company is focused on offline while the other is largely online, the two businesses are remarkably similar. Let's take a deeper look to understand the uncanny similarities. Note: this analysis borrows heavily from work done by two of my Redpoint colleagues, Pueo Keffer and Alex Clayton. By time indexing Walmart and Amazon from a period when they were very similar (1980 and 1999, respectively), several insights can be gleaned. First, their growth rates are essentially the same. The revenue lines for the two companies are basically the same line for the first 15 years. Walmart took 15 years to grow from $1.6B in revenue in 1980 to $82B by 1994. In contrast, Amazon took the same amount of time to grow from $1.6B revenue in 1999 to $74B by 2013. Only now in 2015 is Amazon forecasted to grow faster than Walmart at the equivalent time (1997). Comparing gross margins paints a similar picture. Amazon has maintained similar gross margins as Walmart though Amazon's gross margin ramp has recently been much more robust due to increased 3P sales and contribution from Amazon Web Services. Still, for most of the past decade, Amazon's gross margins have looked quite similar to Walmart's. Looking at the above, it's clear that Amazon is starting to pull away in terms of revenue and gross margin. Yet the similarities run even deeper. Looking at both companies' capex spend and EBITDA margins is very telling. In terms of capex as a percentage of revenue, Amazon was running at 1-2% in the early years, a bit lower than Walmart's 4-5%, mostly due to the fact that Amazon didn't need to invest in retail store infrastructure like Walmart did. Over time, Amazon's capex intensity surpassed Walmart's as distribution center build-out and AWS infrastructure spend increased. Regardless, at a high level the lines are shockingly similar. EBITDA margins are no exception - they are also very similar. Amazon's EBITDA margin from 2004-2010 was a few percentage points below Walmart's on a time indexed basis, though Amazon is now surpassing Walmart as its investments in higher margin business lines start to pay off. Clearly, Amazon and Walmart are quite analogous to one another. The first takeaway is that Amazon has hit an inflection point and their growth and margins are now surpassing Walmart's. For a number of different reasons, Amazon's model should scale better than Walmart's offline retail model. The other key takeaway has to do more with business philosophy. We need to appreciate the fact that both companies are cost leaders in their own right and have made it a point to heavily invest their profits back into their businesses. Walmart has been unyielding in its quest for the lowest prices and broadest retail footprint. Amazon is no different - rather than taking profits, they drive all profits back into their business, further emphasizing their price leadership and betting on new businesses like AWS. Both companies take an extremely long view and do not compromise on long-term vision for the sake of short-term profits. The lesson here, particularly for start-ups, is that making long-term investments into things like R&D, technology and new markets is key to driving lasting value.